The Organization for Rehabilitation and Development in Amhara (ORDA), a strong and reliable developmental partner of the people and government of the Amhara region, is strategically filling developmental gaps in its short and long term projects and programs. ORDA implements a project in Mout Guna area which is characterized by rugged topography manifested with devoid of natural vegetation, soil erosion and severe land degradation. Although livestock asset is one of the major sources of household income, its productivity is very low. To change these adverse situations and improve livelihood of farmers, ORDA fruitfully delivers improved agricultural technologies and integrated watershed development practices. 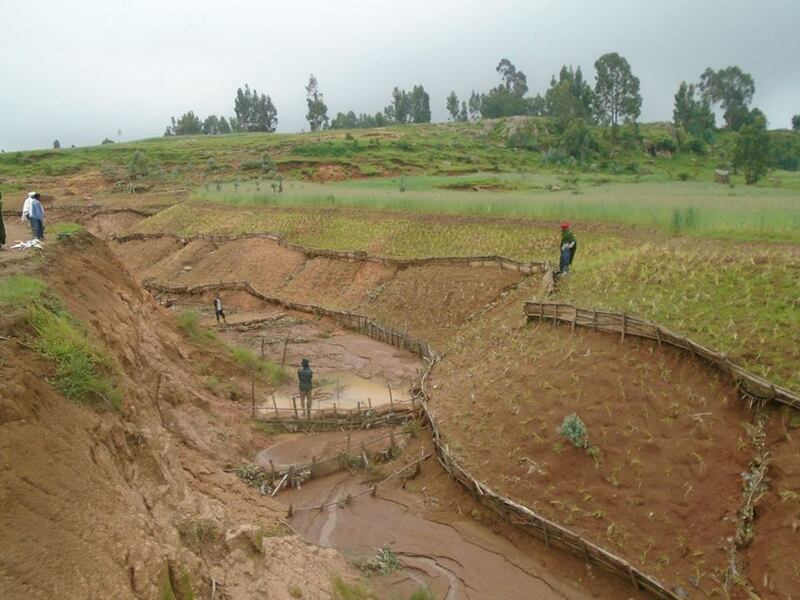 ORDA financed by International Fund for Agricultural Development (IFAD), with a 37.3 million Birr, has started to implement Sustainable Adaptation to Climate Change in Lake Tana Watershed under Community-Based Integrated Natural Resources Management (CBINReMP). It is called IFAD Guna Project which has been working in 15 kebeles of Farta, Estie & Lay Gayint Woredas of South Gondar Zone since 2015. The intervention kebeles consist of 23, 000 households and covers about 51,184 hectares of land which directly benefits 8,000 households (40,000 people). The project distributed various livelihood options like 17 rope and washer pump, 13, 298 hop seedlings, 107 quintal potato tuber, 2,901 propagated apple seedlings, 4 kilogram vegetable seed/carrot, lentil, cabbage and salad/, 162 quintal of livestock forage, 166 fuel saving stove, 9 biogas, 42 cubic meter compost and 396 solar lantern for 1,232 households (91 female headed) in Ata Meher and Arga Meher intervention kebeles in a clustered approach. 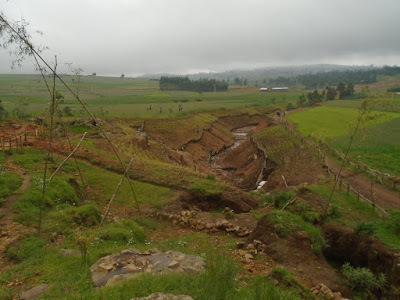 The project targets to achieve outputs: Integrated Runoff Reduction and Moisture Retention Practices, Forestry & Agroforestry Technologies, Alternative Energy Sources, Water Resources Developed & Efficiently Utilized, Agricultural Productivity & Employment Opportunities, Increased Crop, Productivity & Soil fertility, Increased Livestock Productivity, Employment Opportunities created, Access to Social Services Improved, Access to Education Services Improved. Target beneficiaries have been progressively changing their lives. Farmer Kindalem Feleke is to be mentioned forefront. He lives in Guna Begie Midir (formerly Farta) Woreda of Arga Didim kebele at Enset Village. The farmer and his wife woizero Alemnat Fenta have two sons & two daughters. Three of their children attend in a primary school. This poor farmer owns a quarter of a hectare of land and obliged to harvest a few crops, such as potato, wheat and triticale/a breed of oat and wheat/. He got insufficient production from his small plot of farm land. Hence, he was assisted by the government productive safety net program to cover the family’s annual food consumption. Moreover, he frequently used to get debts to buy house expenditures, such as sugar, food oil, salt, onion, soap, and agricultural inputs. At this critical time, he was selected as one of beneficiaries of ORDA-IFAD Guna project. In his village, a small river known as “Enset” percolates from the top Guna Mountain to Arga Didim villagers. However, no farmer was aware to use it for irrigation. Then, Kindalem with other farmers trained on vegetable production and apple propagation using irrigation. The project delivered him the necessary agricultural inputs (spade, irrigation watering can, vegetable seeds and apple seedlings. He practically started vegetable harvesting from irrigation since 2012. The optimistic Kindalem was determined to escape from poverty. 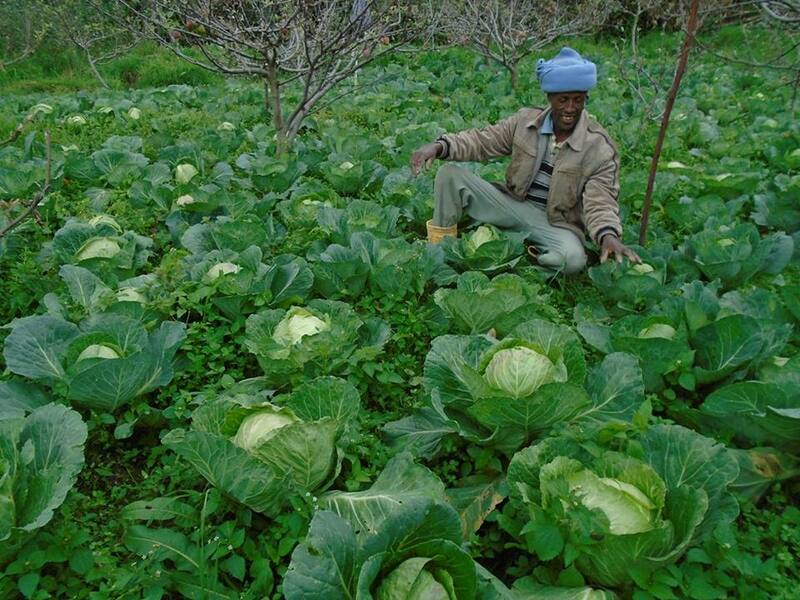 He produced vegetables three times a year and paid off a 12 thousand birr debt. He also bought 5 quintals of teff to an annual family diet. Consequently, he was very much encouraged and worked day and night. In 2013 and 2014 irrigation year, apart from fulfilling all his family’s food and other needs, he changed his small hut to a full- fledged 53 corrugated iron sheet top and bought a mule for a 10 thousand birr. In the years of 2015, 2016 and 2017, he expanded his farmland for vegetable and fruit production. A farmer's livelihood is being improved. Food is already secured for the family. Now, he began building asset and saved money for a family’s clothes, schooling materials, and other issues. In this case, when his ox died in 2016, he immediately bought a horse for 9 thousand birr. This horse is now serving for both farming and transporting fruits and vegetables to market. This person now has built a 60-corrugated iron sheet top house of what he has inherited from his father’s land at Kimir Dingay which is the capital of Guna-Begie Midir Woreda. As a result of the training and tools for apple propagation provided by the project, the farmer has earned an average annual income of about 4 thousand birr. He is now selling a grafted apple for farmers & government offices in the surrounding. Since 2013, the farmer and his wife Alemnat saves 30 birr monthly and have a total of 5 thousand birr in ”Megabe Enset” Village-Based Economic and Social Association (VESA). In addition, he saved 5,000 birr at the Commercial Bank of Ethiopia (CBE). ORDA – IFAD Guna project benefited the farmer to use solar lantern. As a result, he was able to save money he spent for gasoline. The children also have been able to attend school without any health impacts. The farmer, who had been disrespected for being poor, has made a remarkable difference. Today, he becomes a model farmer that various offices and farmers across the zone frequently visit his garden to share his experiences. He’s also coaching farmers and found many successors in that village. Generally, farmer Kindalem has totally changed his life style and he is in rapid progress. Everyone who visits his home can be a witness for his livelihood improvement. Currently, he gets a nutritious food, uses solar lantern (children can study better during night and reduced eye sight problems), saves money and builds asset, implements better with the skill and knowledge developed towards using agricultural inputs and technologies.